Hope your week is going great! If you love Smokey eyes you would have probably seen tons of tutorials on Kim kardashians version! Today is a ‘Get the look’ segment which I have not done in a while on my blog and this is to get the look of kim kardashian of a picture I found online. So let’s get started with the look! Prep and prime your lids with an eye primer and use a skin tone base if you have pigmented lids. Also use tape on your outer V to make sure it isn’t messy. Use a peachy shade on the inner third of the lids. The colour is best matte if you want to wear it during the day. Using a matte grey shade race the outer V and upper lash line of the eyes and lend it really well. 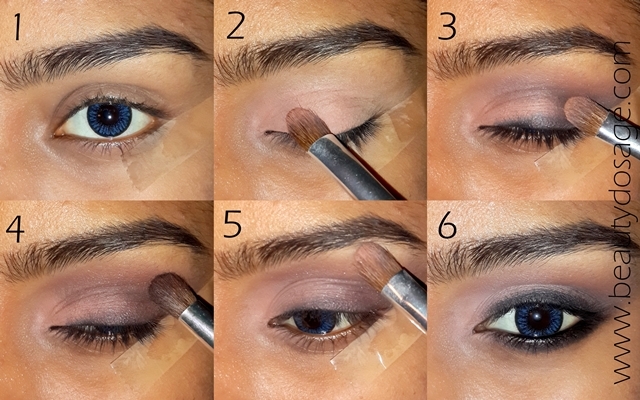 Using a warm brown shade with a blending brush, sweep it in the crease to blend the grey and give a gradient. Highlight the brow bone with a matte cream shade. Finish off the look with some full lashes. If you can get spidery looking lashes, those are best for kim k’s looks. This is a great way to sport a Smokey eye during the day. Just make sure the shades you use are all matte. Hope you all enjoyed this look! More kim kardashian smokey eye looks coming up! Wauw, on the pictures you look a bit like Huda van hudabeauty.com. Impresionante efecto, me encantó el maquillaje! hardly could make diff just looking at eyes..